Rather than acquiesce to unflattering stereotypes (as African Americans were often forced to do), Irish Americans demanded that postcard companies remove the offending lines from their annual offerings. Newspapers between 1909 and 1911 detail protests, boycotts, and calls for the police to confiscate the "indecent literature." 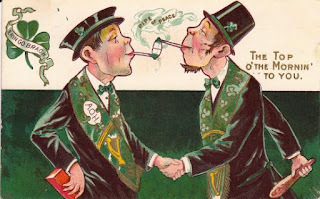 Bigots like to say stuff like, "The Irish don't care about stereotypes, it's all in good fun," to justify their desire to make fun of other groups -- especially white guys wanting to indulge in some good old fashioned humor at the expense of blacks. But, the Irish have a long history of minding. And they pushed back with protests and boycotts.